Launched in August 2017, the school provided opportunities for young people to learn about human rights and engage meaningfully with social issues through social media activism and community action. The goal of this project is to inspire future leaders by equipping them with the necessary knowledge and skills to become changemakers. This project was funded by the Canadian Embassy in Indonesia and Timor-Leste. 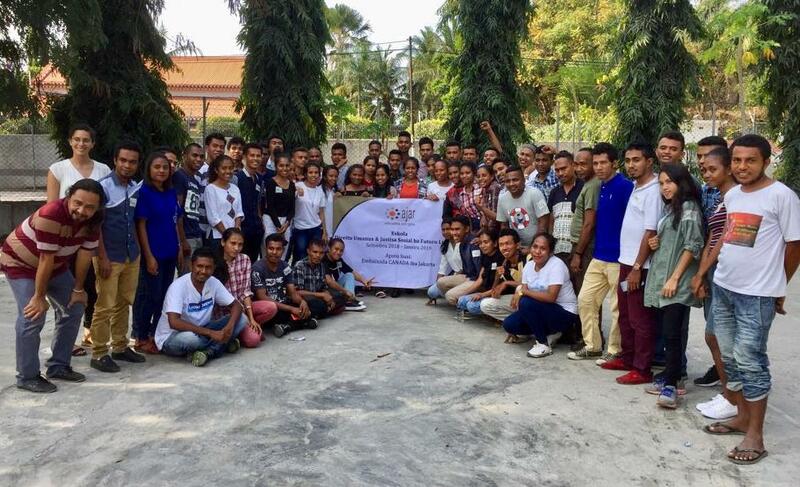 AJAR Timor-Leste recruited youth aged between 18 and 24 from all 13 municipalities, including of those very remote from the capital city, Dili. Some participants have had an extensive background in human rights, some have not. Some are university students and others are not. The human rights school ran for five and a half months from September 2018 to February 2019. The school combined full-day intensive classes with weekend sessions, on the foundations of human rights, including gender justice, transitional justice, leadership, and democracy, focusing on the context in Timor-Leste. Sessions were facilitated by AJAR, but also involved civil society representatives and government officials. At the end, participants learned how to design and use participatory action research methods to build solidarity and advocate with people on the margins. Not only was AJAR Timor-Leste teaching the students on how to be activist, but also how to raise their awareness on social injustices found in the country, especially towards victims of the past conflict and minority groups such as LGBTIQ communities and people with disabilities. Upon the completion of these classes, students were required to conduct a community action project in their own communities. This was an opportunity for them to apply their skills in real life. For example in the municipalities of Aileu and Liquiça, youth mobilised high school students and trained them in the rights of persons with disabilities. This is just the beginning of the Human Rights and Social Justice School. There is tremendous potential for East Timorese youth to steer Timor-Leste to a more just and accountable nation.